Company: Northwest Roofing & Waterproofing Inc.
DIXON, CA, December 5, 2013, Norman Williams, President of Northwest Roofing & Waterproofing Inc., has been recognized by Elite American Business Owners for dedication, achievements and leadership in providing residential and commercial roofing and waterproofing services. 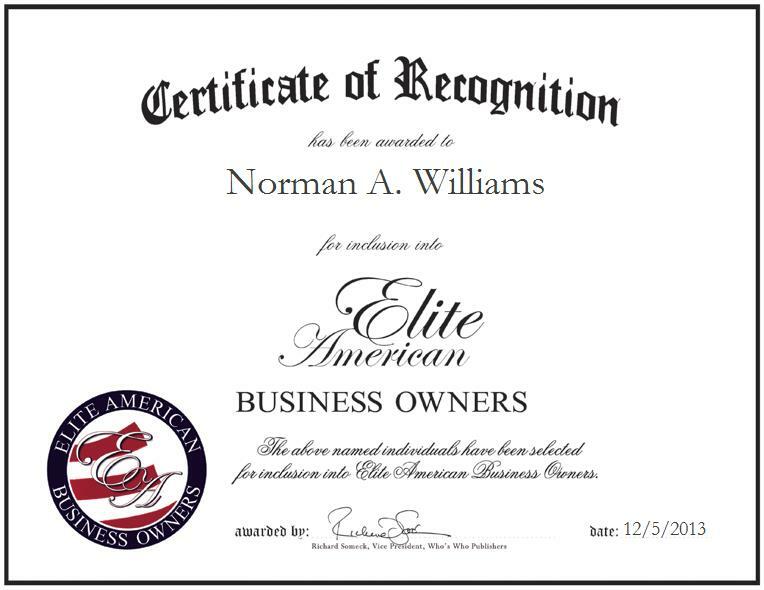 Mr. Williams established his company 22 years ago and has garnered a total of 32 years of industry experience. An expert in energy-efficient reforming fabric, he handles a myriad of responsibilities. Mr. Williams gives estimates and handles crew management. Mr. Williams also manages and oversees new and exhibiting clients in the commercial and residential sectors of roofing and waterproofing, including all facets of roofing, pitched roofs to low slope flat roofs and design, level built up roofing, synthetics single ply, compositions, roof coatings, above and below grade waterproofing, window wall sealant, built-up construction joints and foundation waterproofing. He is currently working for the state of California on the Angel Island rebuilding and re-roofing project on the East Garrison historical site. Mr. Williams believes in running an ethical and strong business that is built by well-rounded leaders and supported by the most talented staff. He surrounds himself with good people and rewards their hard work with compensation and gratitude. Mr. Williams understands that their hard work, as well as his, have contributed to his company’s success. Mr. Williams is certified in installation of TPO roofing, low slope roofing, pitched roofs, and is certified in proper removal of lead paint, and deck coating and below grade waterproofing.